The Blue Morpho butterfly (Morpho peleides) is one of the world’s largest butterflies, with wingspan from 7.5 to 20 cm, bright blue with lacy black edges. The brilliant blue color is caused by the diffraction of the light from the millions of tiny flakes on the upper side of wings. The underside of the its wings is brown with many eye spots. When the Blue Morpho butterfly flies, flashing with its wings rapidly and the contrast between bright blue and greyish brown colour frighten away predators. 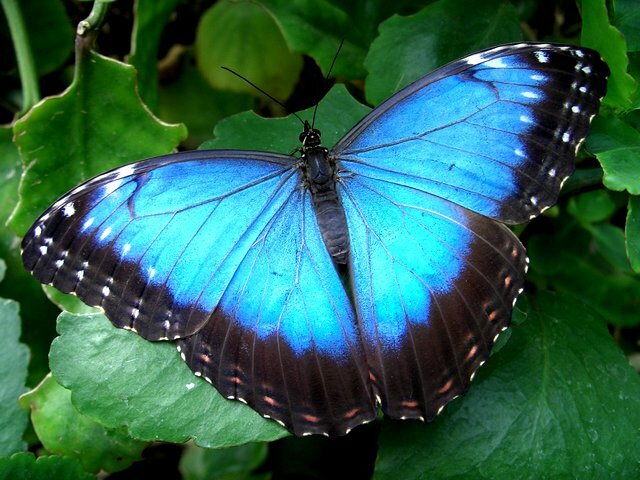 Blue Morpho butterfly lives in the tropical forests Central and South America, from Mexico to Colombia.